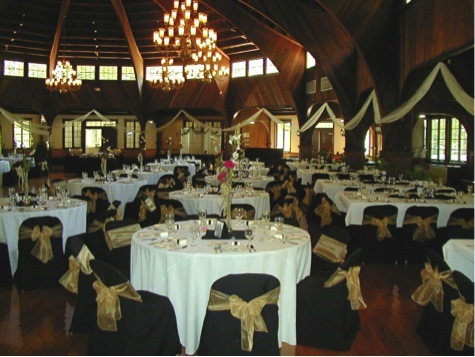 This section provides a look at various ways the Ballroom has been set up for wedding receptions in the past. 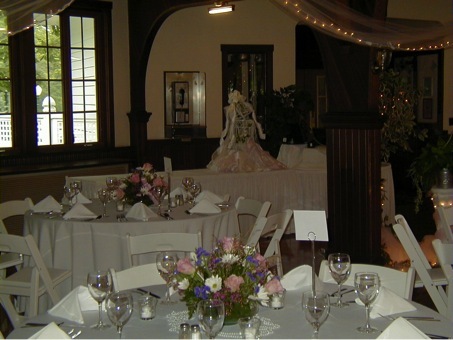 It also shows how the various areas are normally arranged for the bar, cake, gift table as well as the restrooms and loading docks. 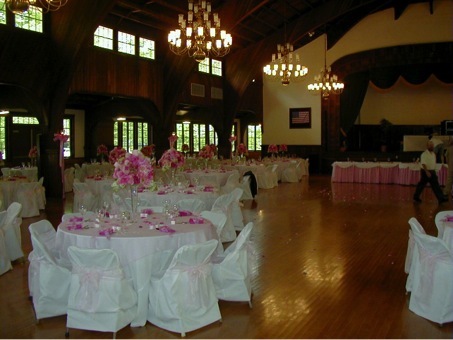 The Ballroom at Meadowbrook Park is an important part of the fabric of the local community as well as one of the premier rental halls in the region. 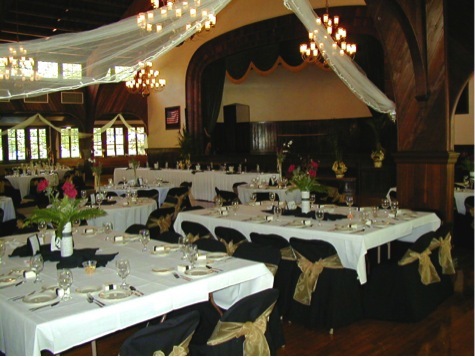 Because of its historical significance and the architectural beauty, the Ballroom is truly a one of a kind structure which has withstood the march of time and is as functional today as it was when it was first opened in 1935. Because of its rich history, the Hopewell Township Trustees, who are charged with the responsibility of caring for the landmark, have instituted a reservation policy insuring those families renting the facility know full well the legacy they are a part of. They now help insure the building will be treated with respect and dignity. It is to be understood that each Lessee will help keep the building in excellent condition for future generations to also enjoy. 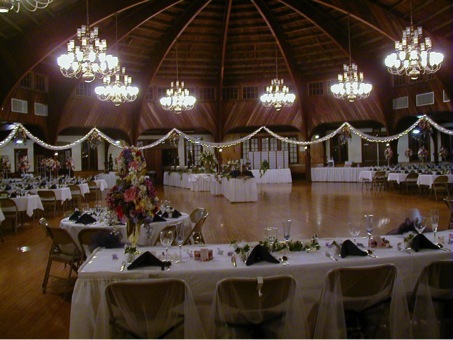 In order to rent the Ballroom for a wedding reception, the couple must have a face to face meeting with park management. The couple’s parents are also required to attend the meeting. At this meeting the ground rules for use of the building are discussed and the individuals are made aware of the awesome responsibility they are undertaking by renting a historical landmark. 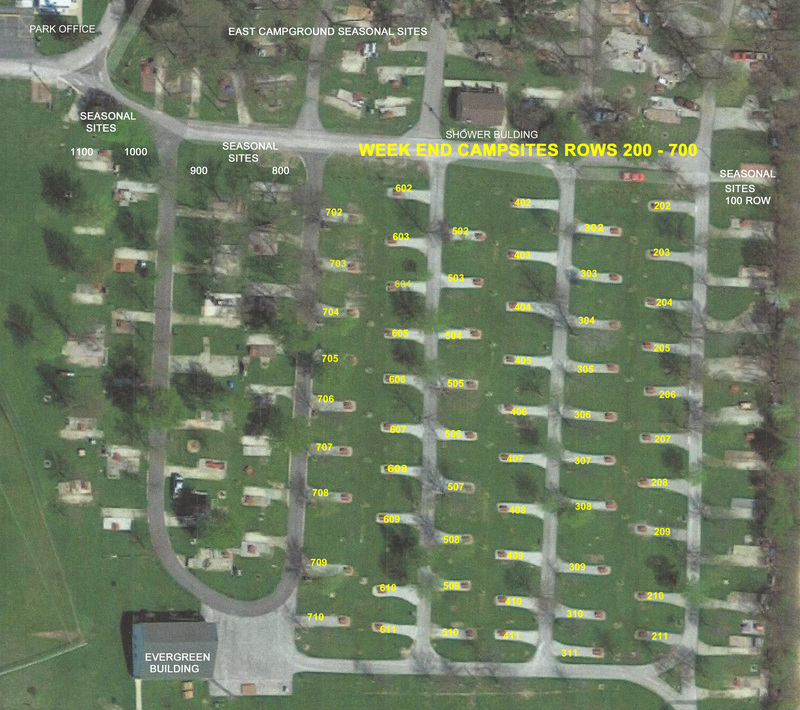 Meadowbrook Park has expectations regarding behavior and conditions which are to be met upon signing a rental agreement. Among these are a limit of 600 invited guests, a limit to the amount of alcohol that is to be brought onto the premises, and the requirement of ending the event at 11:00 pm. a. Who the caterer is and a copy of their food service license. b. The vendor for the alcohol and the amount of alcohol ordered for the event. c. The entertainment (DJ, etc.) and their associates. d. Any other aspect of the reception/event which might be considered out of the ordinary such as Hot Air Balloon, Candles, Balloons, etc. 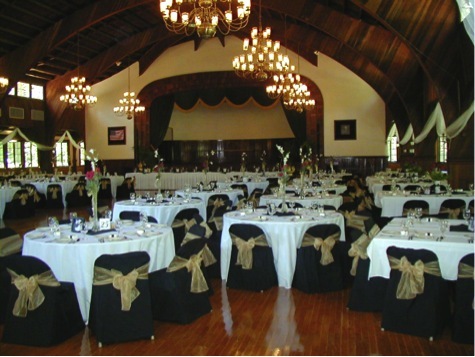 inside/outside of the ballroom. The management of Meadowbrook Park also wants to assure each person who signs a lease for the building completely understand they also assume the liquor liability for the event. It is up to the Lessee to police the alcohol and make sure the laws of the State of Ohio are followed with regard to providing alcohol to guests. There is to be no alcohol brought to the event by the guests. Underage guests are not to be served alcohol. In addition to the rental fee, there is also a security deposit that is due 30 days prior to the event. This fee is set by management at the conference and can range from a minimum of $500 to a maximum of $2,500. The screen lowers from the back of the curtain and it is on the forward portion of the upper stage floor. The screen will drop below the table height so any tables, etc on the stage must be placed behind the screen depth. The bottom of the screen is 22 inches from the upper stage floor. This makes the bottom of the screen 6 ½ feet from the ballroom floor. 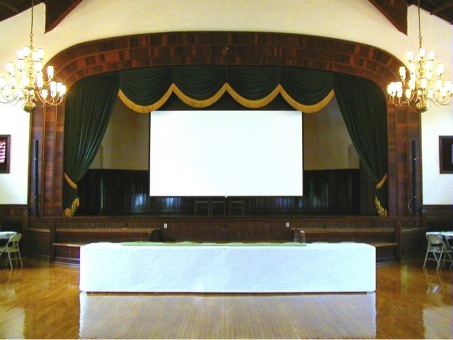 The middle of the screen is 11 feet off the ballroom floor, making the viewing area excellent from most any place in the hall. Disc Jockey’s and others who use the stage can place speakers, etc to either side of the screen on the upper stage without blocking the sight line to the screen. However, placing objects on the three lower sections of the stage will affect the sight line from the side tables. Looking at the Cake Table area or the serving area behind the screen. This area is lighted to highlight the cake. The Meadowbrook Bar. 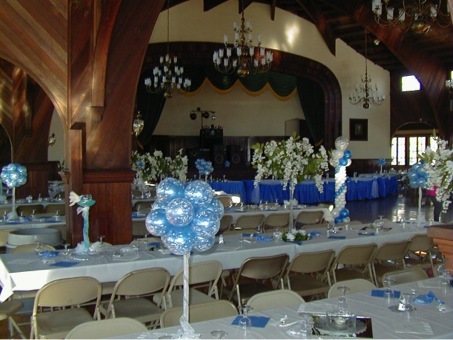 The Bar area is usually set up between the arches adjacent to the southeast Ballroom doors. It is outside these doors that vendors set their beer trailers for events. This makes it easier to bring in the beer from the outside then going thru the kitchen. 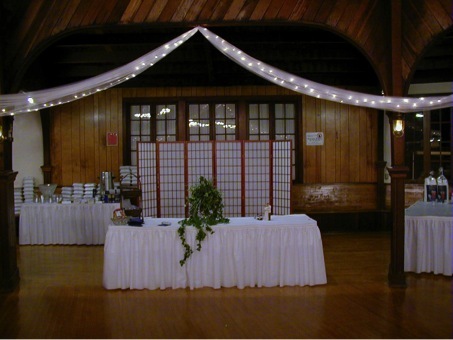 Ron Hiser built a bar for his daughter’s wedding and following the wedding, the Hiser’s donated the bar to the Friends of Meadowbrook to use for rental. 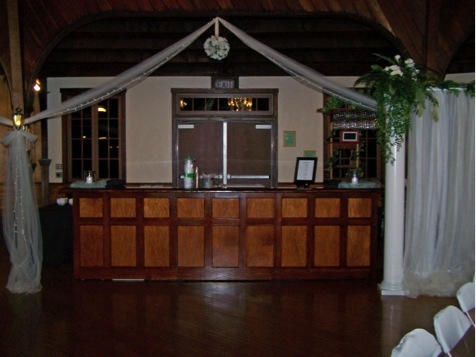 This bar was built of wood and designed to fit the decor of the Ballroom. The Bar is available to use for a $250 dollar donation to the Friends of Meadowbrook. 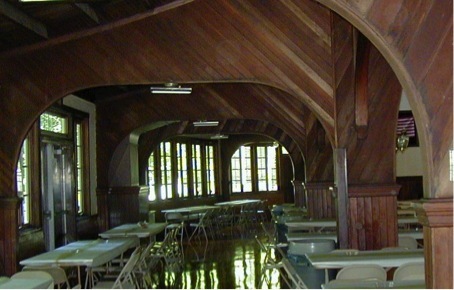 This is an example of moving the double tables together between the arches and then placing a round table in front of the arch. This is used to reduce the size of the area and make it more intimate. 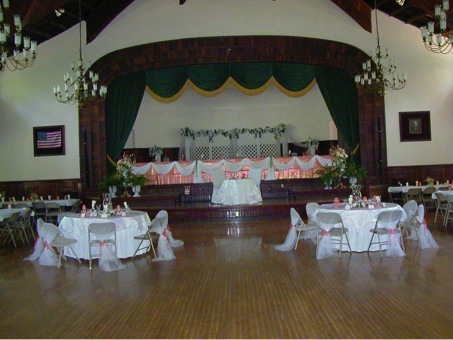 This example shows the wedding party on the stage with the family tables in the center. This view shows the placing of the gift table near the entrance. 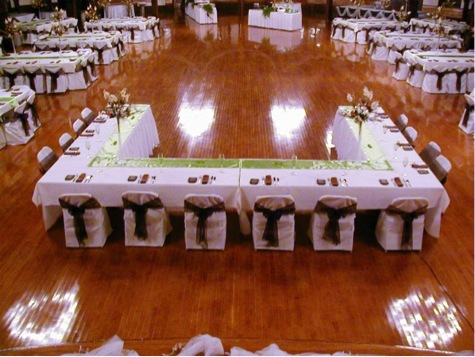 This shows a round table wedding. 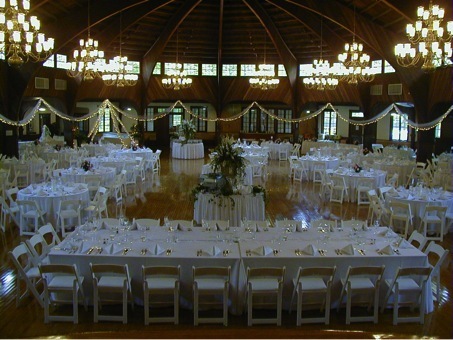 This arrangement must be done by renting additional tables from a vendor and it also adds to the rental fee charged by the park as park personnel have to take down the long tables and store them and then set them back up again following the reception. This shows the south side set for a normal set up with the addition of 8 round tables the park has available. The park does not cover or skirt round tables. 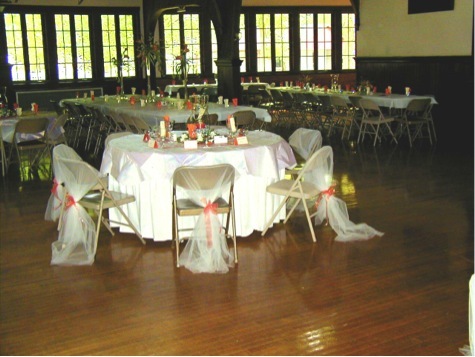 All the extra skirting and chair covers are rented by the Lessee. 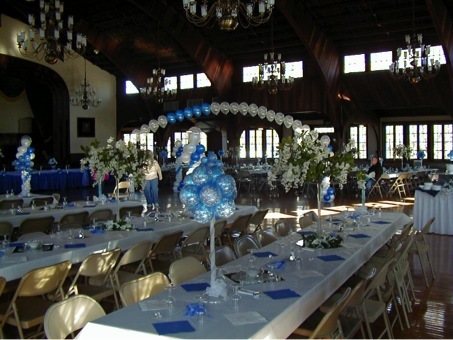 A typical set up done with balloons. This is a typical serving line. 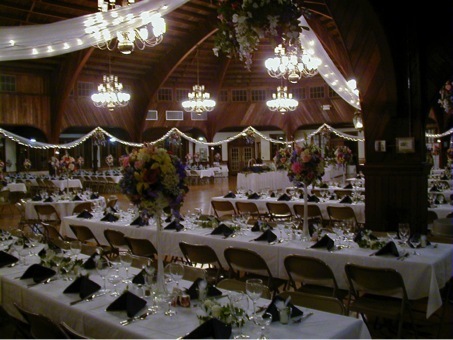 Some weddings set up two lines to serve guests faster. This is a picture of the south side Promenade area. The Promenade area is from the arches to the outside walls. There are benches along the window walls. The tables are 8 feet long and have 4 chairs on the floor side and one at each end. The Promenade circles the entire building and the restrooms and coat room are located off the Promenade behind the stage. Typical Set up for long tables looking from the Southwest promenade to the Northeast entrance. Typical Head Table. This arrangement keeps the stage for the entertainment and the screen. Meadowbrook has an internal sound Bose system that DJ’s and others can tap into. The Bose system was installed and tuned to match the soft Redwood façade of the interior. This is an example of blocking the tables into squares. Looking at the square table look on the north side. 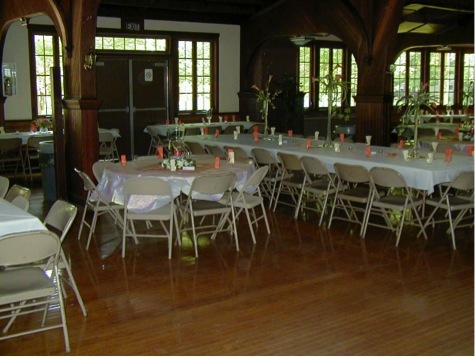 Another example of a square table set up. An example of a reception table with cards for seating assignments. South side square table set up. The park only has 8 round tables. 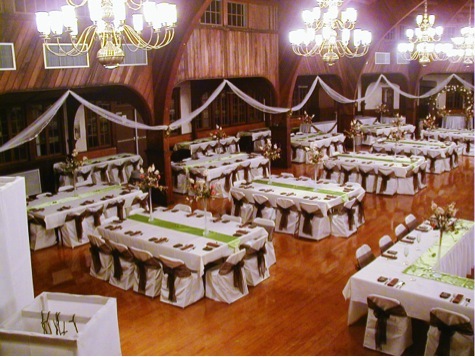 In this set up the party rented the extra round tables needed to make this seating arrangement. 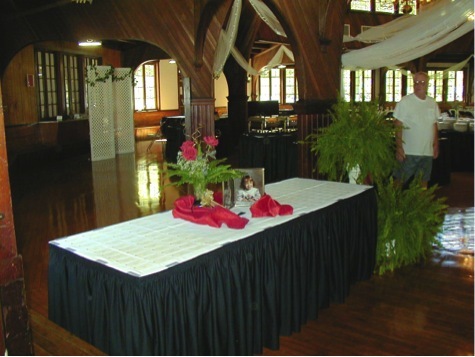 This is an example of making a double table set up. 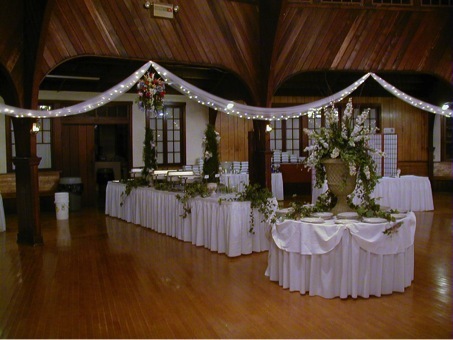 This is four 8 foot tables set between the arches with a round table at the arch. 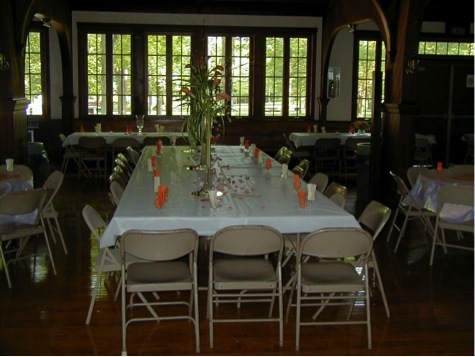 This shows the double table set up with the round tables at the arch and another round table in the middle front for parents. 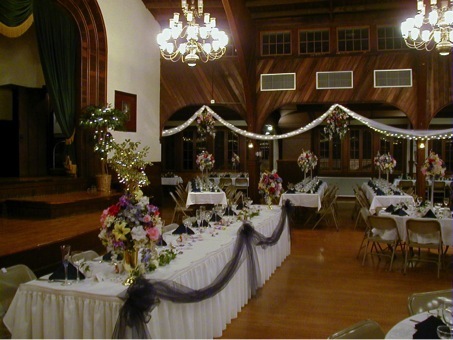 Another view of the double table set up with a round table at the arch.